There was a 7.1 magnitude earthquake in Christchurch New Zealand today, September 4 2010, causing widespread damage, the government has declared a state of emergency. Previously we have looked at charts for major earthquakes in relation to the aspects involving trans-Neptunian planets, especially Sedna and Eris. Sedna again looks to be important in this Christchurch earthquake. It is the action point of a Yod aspect pattern to Mars sextile Ceres. Ceres does seem to have some influence over environment issues. Mars opposite Eris ties this other trans- Neptunian into the configuration. This map from NASA shows the path of the July 2010 Solar Eclipse just touching New Zealand. That eclipse was at 19.24 Cancer, and the Ascendant for the Earthquake is 19.24 Cancer! The Ascendant is most important in astrology, it is the star rising on the eastern horizon for that time and place. Eclipse map courtesy of Fred Espenak – NASA/Goddard Space Flight Center. * “Effection self-government in New Zealand began with the coming into effect of the Constitution Act on 17 January 1853, probably at 00:00 hrs.” The Book of World Horoscopes (Second Edition), Nicholas Campion, p.265. 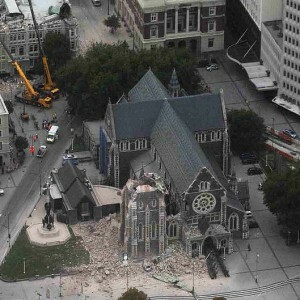 UPDATE February 22 2011 – Christchurch NZ was hit by another major earthquake today, 12:51 pm, magnitude 6.3. A quick look at the chart shows a stellium of planets in late Aquarius, early Pisces. Venus is on the DC of the 2010 quake. Jupiter is square Pluto. Uranus is square the Lunar Nodes, and square the December 2010 lunar eclipse degree. Horoscope for New Zealand is based on the signing of the constitution in 1853*. For the September quake, the lunar eclipse was conjunct the NZ Mercury and Saturn was square Mercury. Today, Jupiter is square the NZ Mercury. For todays quake, the December 2010 Lunar Eclipse was conjunct North Node, opposite Venus. This means that today, the lunar eclipse and the North Node are conjunct the New Zealand North Node. In fact the exact return of the North Node is today 1:03 pm (precessed). Uranus is also square the North Node (exact on March 4). Back in September, Jupiter was square the NZ North Node. UPDATE December 23 2011 – Yet another earthquake in Christchurch today. “Christchurch has just been hit by a major aftershock, after a “vicious” 5.8 quake hit the city at 1.58pm this afternoon.” Major aftershock hits Christchurch. Another quake in Christchurch yesterday…no appreciable damage done. If one accepts the Geodetic earthmap ( Uranian Institute…is online)… and I am finding it to be highly reliable…then Christchurch has about 11 or 12 degrees Capricorn rising. A nice Yod ( thank you Jamie ) arranged around Aries ( equal house)IC …Cheiron/Neptune, Uranus and Jupiter opp Saturn at MC and another one around DC….Ketu, Sun Moon opp Pluto in AC. How come everything starts at Greenwich is a mystery…but ( thank you Susan) Ptolemy used a similar map a couple of thousand years ago. His map started in the Fortunate Isles off the East coast of America…so if that was accurate then and Greenwich is accurate now then it may turn out to be a moving point of energy….does anyone have any ideas about this ? Japan has about 12 Scorpio AC and its earthquake was easily understandable from that. California has around 7 Aquarius AC….and its 1906 earthquake is easily understood from that. If it is going to be a mega blast with much destruction then Rahu and Ketu will be very involved with backup from Saturn Uranus Jupiter Pluto in particular. It is possible to get a major earthquake with little planetary warning…and these seem to be the ones in remote areas that do not do much damage. A lot of planets all lined up may produce a lesser quake and major destruction. A young man who was in a terrible earthquake in Turkey wrote a nice page about Geodetic Turkey and the lunar nodes plus….from inside his car a day or two later. Can be found under Geodetic Turkey as a search….my heart goes out to him. Actually Ptolemy’s 0 Aries was a longitude position so not far off what we have now. I thought New Zealand was an aquarius nation. “Christchurch has just been hit by a major aftershock, after a “vicious” 5.8 quake hit the city at 1.58pm this afternoon.” Major aftershock hits Christchurch.